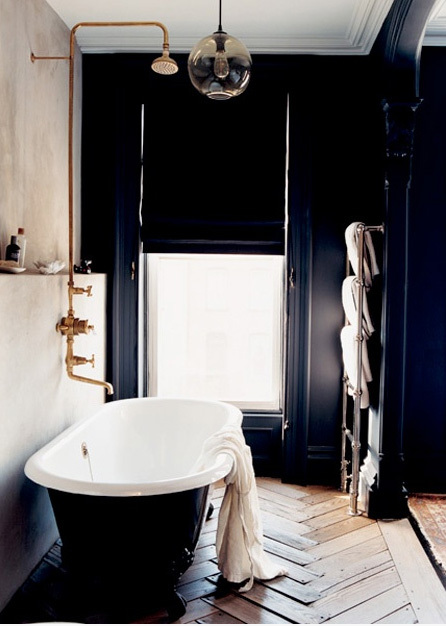 Bathrooms can be sometimes a little overlooked. We’re good at spending time searching out all the practical stuff (tub, taps, tiles) and not so good at finding those all-important elements that turn them into a sanctuary. I can hardly talk my bathroom needs some serious help its one of those rooms in the house that hankers after some attention as its been very neglected. So I’ve been thinking of doing all sorts of things to take it to the next level – here are a few, bearing inÂ mind that I want the space to feel like a luxurious retreat for relaxing after a long exhausting day! Push the paint palette or wallpaper choice. I’ve played it way to safe, but bathrooms are rooms we can take the most risks being generally smaller than the other rooms and places we tend to zoom in and out of. Jenna Lyon’s bathroom in Brooklyn happens to be one of my all time favourites I’ve showed you this image a zillion times (apologises) but I love it! Storage is key. Ugly stuff goes behind closed doors, cool stuff should go on open storage like a bar cart or dresser or shelves. One thing I have done that works is put little bottles of hand wash, hand cream etc. on a tray it helps ground them and takes away that itty-bitty feel. Ramp up the lighting. This has made the hugest difference to my space it’s elevated it to a very grand status, a trick I use time and time again. Go supersized and itâs amazing what happens. Add quirky hooks to hang towels or robes from. I haven’t but I plan in doing so. Details matter and will help set theÂ room apart. FinallyÂ some finishing touches, plants, flowers,Â candles maybe a rug the odd chairÂ will make the space feel way homier.